I have been working on a custom client which is an extension of Ender's client for a while now. I have added several (in my mind) improvements, and now I have decided the time has come for a public release! You can now use the jnlp launcher to install my client! It is compatible with Ender's launcher: the files will only be downloaded once between the two launchers (on update), and my jar file will be named lsalem.jar rather than salem.jar. This means that you can mix the use of both launchers arbitrarily for your comfort! If the jnlp file is not working well for you, the jar might be an option. More recent versions of Java do not allowed self-signed java webstart applications to run. 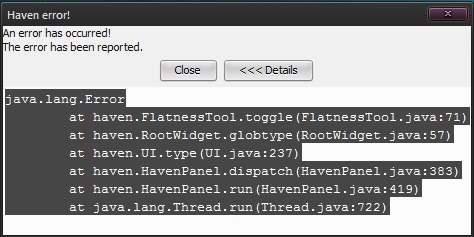 Long story short, you'll have to add specific sites to the exception list of your java installation. For this client, that site is http://donnessime.github.io (FYI, Ender's client is at http://enderwiggin.github.io). From the Salem/bin/ directory. Make sure that the direct java link is accurate! I will be moderating these myself, so don't feel bad about posting there: it's much more likely to stick around than a post in this thread, and I'm less likely to forget about it. Chat notifications will now show when there are unread messages in chat channels. It works in all channels except for the system chat. Crashfixes. Most importantly, the crash when clicking on the chat (notably, url's) and the crash when teleporting somewhere. Out of memory errors have not been fixed, but I have not encountered these yet myself. Alphabetical ordering of the characters is now an option in the character selection screen. For those of us that have a bit too many alts. There is also a textbox for further filtering of your alts! The ordering choice (alphabetical/by last login) will be respected by the filtered list. The client will remember the visibility settings of the various claim types and the homestead pointers. The client will not render anything when it is minimized. You'll never notice this directly, but it does lower the CPU usage of minimized clients drastically. You can press ctrl+N for brighter mines and houses. You won't need a torch anymore just to see where you're going! Side effect: also brightens the darkness, so it might not be as obvious exactly how deep in the darkness you are from the darkness of the screen. There is a new button in the main menu, that will allow you to walk towards your homestead. It won't allow you to locate it accurately through the ctrl+Q locator, however. It is the (currently ugly) button between the homestead pointer toggle and the heightmap toggle. The client will log chat messages to you, which will end up in "C:\Users\<account>\Salem\logs\<character>\<channel name>\" or similar folders on other operating systems. Hotkeys are now customizeable to some degree: you can bind certain console commands to key-combinations involving ctrl+shift+<one single letter>. The camera will start farther from you when you log in than on the other clients. I was constantly scrolling backwards after each log in previously, personally. These toggles are found in a new tab of the option menu, and all default to off. 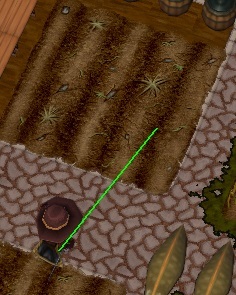 This will render all crops as a single instance in the middle of the field. Notably helpful for reducing cotton lag. Includes a crop scaling slider because the single instance might not be easily visible. Careful for exploding pumpkins! Reload your area after changing these settings, for example by entering/leaving a house or teleporting to boston and back. Similar to the option in Ender's client in haven, this will render the paths of all moving entities on your screen in fancy green lines. 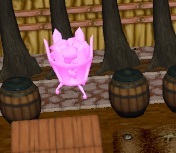 These are overlayed over all other terrain and so on, so they will not hug 3D landscapes. They work fine in my opinion, though. Particularily handy for animal hunting (it will actually draw branch trajectories for argopelters, so you can evade those more easily)! Experimental laptop controls, which should allow camera control without a mousewheel. Not tested very well, so some things might not be possible with it. All trees are rendered as smaller versions of themselves for visibility. Requires a reload of the area to toggle. 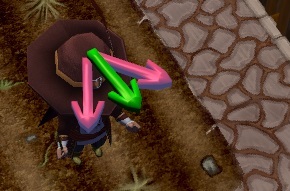 Frustrated of the randomness of the prospecting arrow, I set out to improve it. The single original arrow is replaced by three arrows. 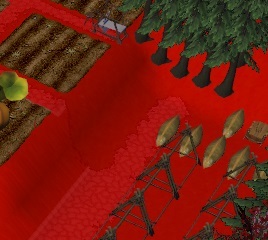 The two red arrows show the interval of possible directions the closest mine is. The green arrow shows the middle of that interval. Follow the green arrow. Simple, tracking will always be enabled as soon as you log-in. Note that this will most likely not work yet for the area you start in (which will need to be reloaded as if you toggled tracking manually). Toggle the visibility of every group in your radar config file separately without messing with the radar file itself. The changes will not be remembered and are simply meant for temporary adjustments. Your radar.xml will be unaffected and it can be reloaded as ever through ":radar reload" to reset your visibility settings. Limits the target FPS of the clients to 10 rather than 50 when a client is not focused (the active window in your OS). Should ease your CPU's load a fair bit. Will take tiny (1-pixel) steps toward your primary target (the top of your list of enemies) when you are not looking at them and you are not walking somewhere else. This is mainly just a test whether I'd be able to do this, and I was! Of course, I will try to help out on other issues you encounter as well. Please post with those here. Note that crashes you encounter while using my client should probably not go the Bugs & Technicalities. Post them here or pm them to me, and I will bump them along if applicable. I am open to suggestions for future updates. Feel free to post them here! Of course, very big credits to EnderWiggin for actually creating the custom client! My changes are minor compared to the work he performed on the custom client, and I have happily used his client for a long time. The 1x1 field fix code which I got from Alloin, usernm or borka. No-one seems to remember. Edit: The credits for the 1x1 fix go to Trojanz, a.k.a. Chiprel on the forums. My testers, mainly people from Arcadia for general testing. Binks in particular for testing the client in situations i'm too much of a coward for myself as well as suggesting some of the more awesome features. The source code for the client is available at my github as a fork from Ender's client. This also means that I will continue to incorporate future changes by him. Changelogs will, from now on, be found in the client's changelog, as well as be posted here as replies. All changes should find their way to the list in this post. If there's something missing, please let me know. Last edited by Kandarim on Sun Jan 29, 2017 5:57 pm, edited 26 times in total. 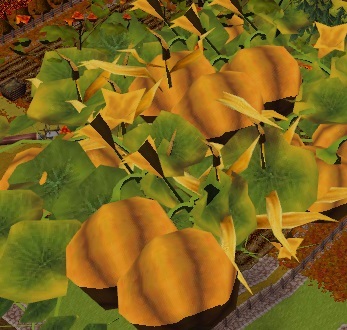 My god, an actual fix for crop lag. PRAS. Kandarim wrote: This client might or might not work for people not on roanoke. And here I thought we were special. I've gotta say, the crop lag was so bad for me that I almost couldn't stand it anymore. This client add on saved the game for me. Thanks Latikai. when i lunch my client, it says "connection refused: conect"
Saladin wrote: when i lunch my client, it says "connection refused: conect"
aww man, I'd hoped my humour would be accessible to all.